I just read an article from The Writers Store that one need balls of steel to get a story out (ref. The Writers Store). Whilst this may be true, it seems to me that one needs only feather light balls for closing doors to a story. 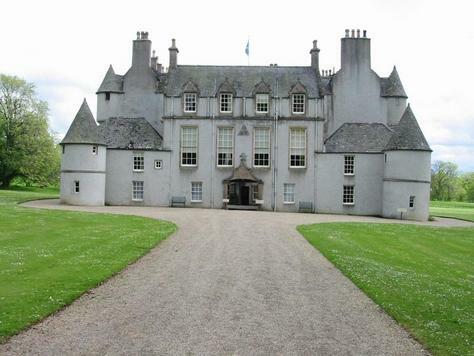 Recently, the doors to Leith Hall – a beautiful 17th century Scottish laird’s residence overlooking some of Aberdeenshire’s finest rolling countryside in Scotland – were closed. Most probably because of lack of money or using the wrong pair of balls. Whenever a building closes, very few people think of the stories that get locked in. They may not don’t dissapear completely, but the platform that formed the stories and sparks people of to retell them over and over again, dissapears. A decade ago, my mother in law as property manager of Leith Hall. My husband and I had our wedding welcome coffee there, following in the footsteps of the Spanish queen who had a coffee at Leith Hall many, many years before that. But it was not the closure of the house that hit me – even though it is a place I spend many lovely holidays and functioned as the perfect decor for the party before my wedding -, but the realization that there are no longer guides that tell the stories linked to the house to a large and wide spread public, such as the one of a Spanish queen having coffee in one of the rooms or one of the Leith family members fighting at Waterloo. A grand old building standing there with a locked door has something mysterious, but also looks lost. It raises curiosity, but also breathes a kind of saddness and lonelyness. Like a playground without children or a painting in a galery without a guide or a home to tell the story that engages, relaxes and explains. A message also important for leaders in business who need to steer knowledge, inspiration and innovation on the base of history whiting their company. Afterall, it’s the wholeness of a building (people’s stories within a natural or digital place) that creates beauty and outside interest from within. I can believe that one needs balls of steel to get a story out. A pair of sturdy balls it seems. Unfortunately, the balls one needs to lock a story in, seem to be of a far lesser caliber. Perhaps it’s only money that can put in the real weight of balls to keep storytelling going, since the lack of it closes doors to stories without much thought. ← Te druk, geen tijd voor … Echt Waar?